Today was my first day of school at Indiana University. It’s weird to be back in college after basically 10 years out. It seems my time has not been my own, the past couple of days, getting everything ready. The Trucker is taking on even more of a utility role. 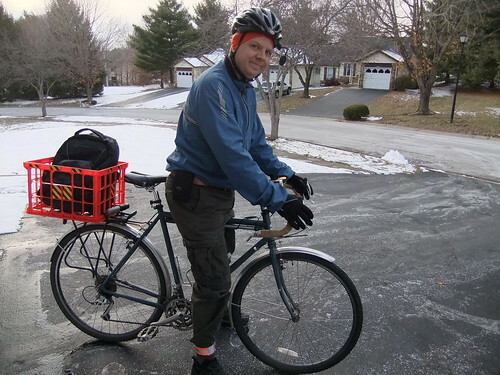 I’m going with a milk crate and backpack for now, as my pannier didn’t seem like the right tool for the job. So far it’s convenient, but it does affect the handling. I’m going to try mounting the milk crate sideways and see if that nets me some improvement. Here I am yesterday, doing a trial run of the new commute. My commute used to consist of basically five miles to work, sitting at a desk all day, and then riding five miles home. I still have the same five miles or so to get to campus, but then it’s many small trips throughout the day. Then five miles home at the end of the day. There’s a lot I’d like to write about, but time is hard to come by at the moment. Hopefully I’ll find some time soon, though, as I have a lot of good bike stuff on my mind. The next few days the forecast calls for somewhere between 1-4 inches of snow. I have mixed feelings. I like snow, and I even like riding in snow, but I really need to get some good long training miles in, and soon. More about that later. Also, hey, how about a “subscribe to comments” option on the blog? It’s an easy WordPress plugin. The milk crate certainly has some positives, particularly if you have to be ready to carry odd stuff. Once I found a trunk bag and a laptop-friendly pannier that snaps on and off the rack, though, I have come to appreciate the stability and simplicity of bags which were made to work with bicycle racks. Wait until you get a load of the freshmen! How do you have the milk crate lashed on? Is it easily removable? Or are you going to do some long-distance training with the milk crate on? That’s be novel, I think. The milk crate, like a front basket, allows the utmost in convenience for repeated loading/unloading. But the crate is waaay back there. I’m thinking the handling would be improved considerably if the backpack could be somehow located closer to the seat post. Have you also considered a front basket? This is a college bike now. You don’t want it looking too nice. I think the basket is the right touch. Reuben: I’m in the general studies program. This semester I have a nice ecclectic schedule including photography, media production, GIS, and then some. There’s already a comments RSS feed at the bottom of the page. Or did you mean somethign else? Tim: The milk crate is attached with velcro zip ties. It doesn’t go on and off really easily, but probably 10 minutes would do it. Steve: That’s a possibility, but I’m going to try this for a while. All the ones I’ve seen are either too expensive, or have major mounting and/or carrying drawbacks. This way I just grab and go. Chris: I haven’t tried the front basket. I’d be willing to consider it. However this is cheap. I know it’s far back but any closer and it bothers me when pedaling. I am going to try mounting it cross-wise, rather than lengthwise, to see if I can address that problem. I am loving easily being able to toss my backpack in and grab it out, and the same with my u-lock. Doc: you hit the nail on the head. This ghettoizes my rig at least a little bit. AND, it’s cheap and practical. Not sure if this is going to be a long-term solution, but it’s working well enough so far. Well I was talking about an email subscription to follow-up comments on posts I comment on. The comments RSS will subscribe me to all comments on any post whether I’ve commented on it or not, right? Ikea sells picture hanging hooks that’d get that bucket down lower. Cheap, too. BTW, that bucket is in IU color! School is fun! Good Luck with whatever you’re pursuing! !